Myramid has extensive experience on the design and implementation of vapor control systems. These systems include vapor collection systems designed to meet 100 percent capture efficiency which are controlled by a vapor collection or destruction unit. 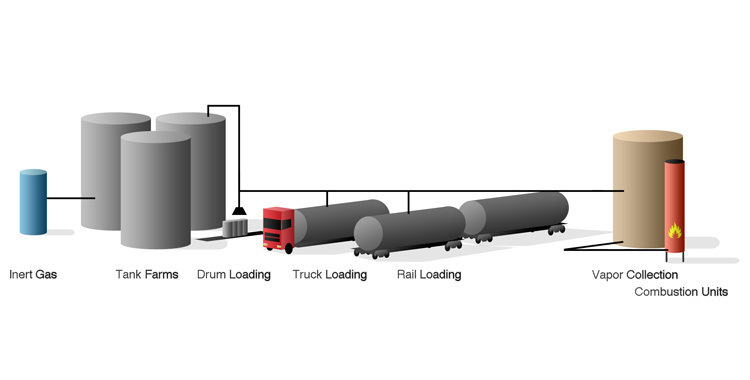 Vapor Collection systems collect the vapors from tanks, transfer stations, loading stations for rail, tanker, totes, drums, and pails. The systems are custom designed to minimize product loss and inert gas usage. We have technology that can lower the load on any control device, saving money on both unit size and utility usage. Control device options are typically based on many site specific factors and regulatory requirements. The US EPA’s Best Available Control Technology (BACT) drives the requirement if your facility falls under a regulated industry. We have partnered with a mix of companies and can hep you chose the best fit for your needs. Our value added system design takes into account regulatory requirements, flexible operations, and lean manufacturing. Typical control devices include flares, enclosed flares, thermal oxidizers, recuperative and regenerative thermal oxidizers, carbon absorption systems, advanced absorption systems, scrubbers and chillers.